American Buffalo/Bison are interesting, challenging and profitable. Bison calves are reddish brown when born and weigh 40-50 pounds. Calves do not have the pronounced shoulder hump. Bison grow and develop rapidly and in several months weigh 300-400 pounds. Cows reach their adult size in three years but bulls continue to grow for six to seven years. The mating season is usually July and August. Bison cows will breed at two or three years of age and have a gestation period of 275 days. Cows will have a calf every year if their feed and nutrition are good. Mature cows weigh around 1000 pounds and bulls weigh 1500-2000 pounds. 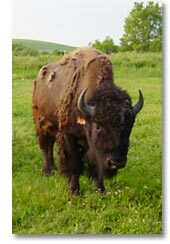 The normal diet of Bison is native range grasses; however, they eat many things cattle do not. Bison are efficient converters of feed but the National Bison Association recommends that the animal unit per acre formula of range feeding be the same for bison as cattle. Raising Bison is more than a hobby or a passing fad; it is a viable industry. There is a strong demand for Bison meat and by-products and prices are consistently higher than for cattle. There are financial advantages to raising Bison over other livestock species: less illness, veterinary expense and death loss due to superior Bison hardiness along with efficient feed utilization and long reproductive life. Bison are regulated the same as cattle by the states and federal (U.S.) government. Bison need health certificates when they change ownership. Requirements vary from state to state, and the state of destination must be contacted when transporting Bison interstate. Bison meat tastes great! It has a sweeter, richer flavor than beef and can be prepared much the same as beef. Prior to cooking, Bison meat is darker. This coloring is due to the fact that Bison meat does not marble (produce internal streaks of fat) like beef. The lack of fat insures that Bison meat will cook faster. Fat acts as an insulator - heat must first penetrate this insulation before the cooking process begins. Marbling aids in slowing down the cooking process. Since Bison meat lacks marbling, the meat has a tendency to cook more rapidly. Caution must be taken to guarantee that you do not overcook Bison. VALUE - The value of Bison is not what you pay, but what you get in return. Nutritionally you are getting more protein and nutrients while getting less fat and calories. Bison meat is a dense meat and tends to satisfy you more while eating less. HEALTH - Bison are handled as little as possible and spend their lives on grass, much as they always have, and very little time in the feedlot. They are not subjected to questionable drugs or hormones. The members of the National Bison Association felt so strongly about this that they have a resolution opposing the use of these substances in the production on Bison meat. NUTRITION - Research begun by Dr. M. Marchello, University of North Dakota, has shown that Bison is a highly nutrient-dense food because of the proportion of protein, fat, minerals and fatty acids to it's caloric value. Comparisons to other meat sources showed that Bison has a greater concentration of iron as well as some of the essential fatty acids necessary for human well being. Caution should be exercised however, as ground Bison comes in different fat content grades. The lower the fat content, the lower the calories and cholesterol level of the meat.